I recently did an event for a retirement home in London Ontario and unexpectedly was sharing the stage with other artists. I was there to do caricatures and had an amazing time drawing the guests, check out the what the client had to say below. The other artists weren’t drawing, but were certainly amazing. Check out the images below and you will see what I mean. The entire experience was wonderful, Bruce was the hit of our Open House event. Very professional and personable. We can’t wait to have him back for another event! Definitely and experience to remember for all of our residents! The first one I did not know, but here is the story. An old tree on the property fell down and the owner commissioned a wood carver to create an amazing piece of art to hang on the wall. 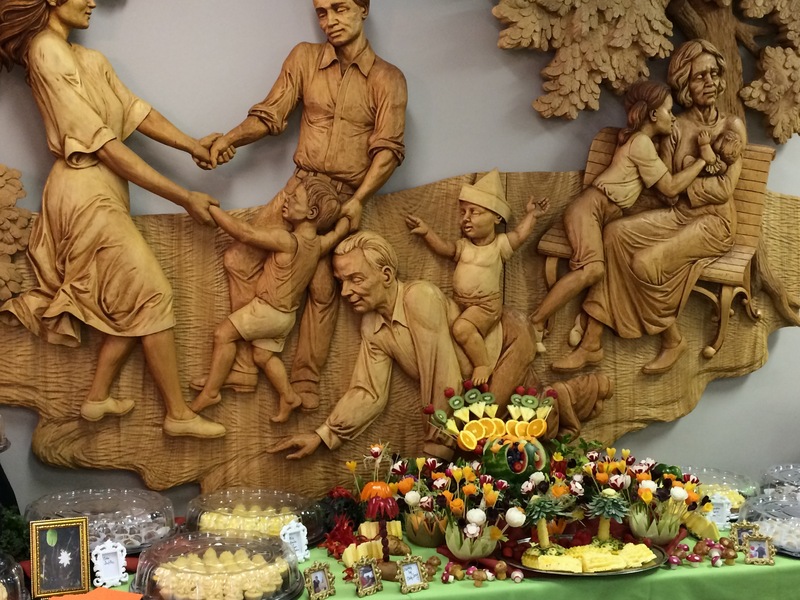 Check out this beautiful wood carving. The second artist was a man named Tony who was the Chef at the retirement home. He created this wonderful table of food that no one wanted to touch because it was so beautiful. He was certainly an artist in his own right. Amazing! Bruce Outridge is a caricature artist from Burlington Ontario Canada and is available for corporate vents, weddings and more offering live caricature entertainment for guests. You can learn more about Bruce or book him for your next event from his website at www.bruceoutridgeproductions.com.